so I ebayed a lot for a few month and found a 1992 mitsubishi colt 1.6.
everytime I floor the pedal, the cheap chino-korean tyres skeek in agony. that isn't really an issue as my average is 30km/h in the city. no air-co, no abs, no computer, a cassette player and a sunroof. 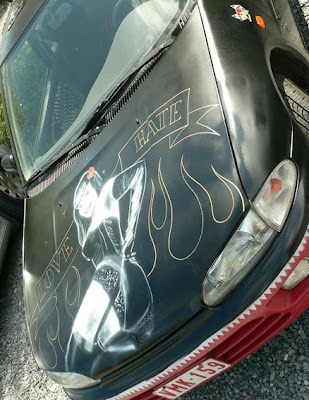 I covered the interior with fake muppet fur, painted the birght red in mat black with a poorly made betty page on the hood and a few pinstripped flames. the "Mr horsepower" stikers are the most expensive thing on that car. there always is a slight moment of amazment when I get in an intersection, people just gaze in horror and shock, and I take the opportunitty to cross the intersection. and if someone wants to play, blamoh, it's a regular sleeper with more than decent accellerations. to my great great surprise (/dissapointment?) it just passed the technical inspection (I didn't even check the headlight adjustment, just deflated the tyre to cover the 15 years old suspensions), so I guess I'm stuck in the little black thing for another year.